The Stock market in December of 2018 dropped enough to add it up to a stock market correction (worst stock market performance in month of December since 1931) due to investors sentiment fears of a slowdown in US Economy in 2019 even though companies fundamentals are still strong. We at CFE Finances like to share technical data and markets comments with our bullish CFE Finances customers and fellow investors. When reviewing technical analysis, the chart below illustrates how the SPDR S&P 500 Index ETF has performed from 1996-2018 (Source: SeekingAlpha; A Market Bottom Could Be Near by R. Morwa). What this chart show us is a trend line (red line) from the stock market corrections in 2007,2011, 2016 to the end of 2018. 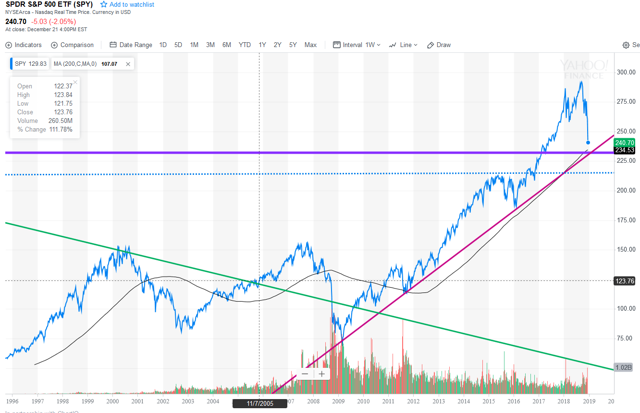 The flat line in purple is the level of the SPDR S&P 500 Index ETF (SPY) 234.54 a 50% retracement line from 2016 lows that the trend line (red line) crosses. Again the red line shows within a line significant stock markets point drops from 2007- 2018. Also where the red line and purple line cross shows a very established trend line that is a major support level . It appeared to indicate a great buying opportunity is coming very soon because the blue line is slightly above it (R. Morwa). The green line shows a trend of decreasing volume on every significant pull backs since 2011. Also volume is shown at the bottom of chart. The blue line is the SPDR S&P 500 index ETF (SPY) at a point just above the (purple) flat trend line (3% to go to flat line). The author of the Seeking Alpha article pointed out that the bulls would not let the stock market drop to flat line because it would create a low that would cause a bigger selloff. Instead the author was correct the bullish day came the day after Christmas on December 26, 2018 after retails sales number was announced, the largest increase in 6 years that created the biggest point gain in the history of the Dow Jones Industrial Average up 1086 points, a 4.98% gain. There is a good chance for now this market correction of 2018 is over because bulls kept the SPDR (SPY 246.18) and other markets from dropping even further. Will the Santa Rally continue through the end of the year and into the New Year? Good chance it will. It is a great time to add great companies to your portfolio while they are on sale. Congratulations for staying long in this treacherous stock market. This correction should take the markets to new highs. Dow 30,000 maybe in sight within the next 3 to 5 years. Although markets are very volatile due to uncertainty regarding the China trade war as well as possible higher interest rates in 2019, long-term investors will still have to be patience. Remember overtime stocks produce high profits for us as investors. We need to all do our due diligence and review our stocks financial statement and make sure companies sales and earning are still increasing from quarter to quarter and year to year. A good place to review your stock portfolio is at your local library and read all the Valueline Surveys for stocks you owe and future stocks on your wish list. Remember when you buy shares of a company, you own a piece of that company. The stock will appreciate in price when the company shows increasing sales and earnings which equals profit. Reinvest all of your dividends which will increase your shares over time while lowering your cost basis of your company shares. Good luck and happy investing from CFE finances, we will be in touch with another newsletter soon. If you have any questions or concerns email us from our contact page. Fixed Indexed Annuities- Am I invested in the Market? You may think to yourself…that sounds like a scam and I’m glad that guy is not my adviser. The truth? This solution does exist and you’re not actually invested in the market and you can take part in market gains. How’s that possible? It’s all because of the fixed indexed annuity. So what is the Fixed Indexed Annuity and how does it work? Fixed indexed annuities are offered by insurance companies. As of right now they are not considered securities since the principal is not invested in the market. They can be sold to you by someone with just an insurance license. If your principal was invested in the market it would be considered a security and only licensed financial advisers would be allow to sell this solution. Just like a fixed annuity, your money is placed into the general account of the insurance company and you are guaranteed a rate of return. The rate of return is actually decided by you. You can choose an index and get a partial rate of return of what that index produces over the course of a year. Again the money is not actually invested in the index or the market. Let’s look at an example to cement these ideas. You have 100k to invest, but don’t want to be in the market and you want a rate of return that will beat the local bank’s CD offering of 2%. So, which one do you choose and what does this actually mean. The fixed annuity will pay you 3.90% for 5 years tax deferred. So in essence you’re getting $3900.00 each year for the next five years. Grand total $19,500. You take your money after 5 years ($119,500.00) in which the 19k is taxable as earned income. Now the fixed indexed annuity is guaranteeing you 7% a year based on the performance of the S&P 500. So if the S&P does 5% you get 5% and if the S&P does 12% you get 7% because you are capped at 7%. If the S&P does 1 % for the year, you get 1%. So you can still get a higher rate of return, depending on the performance of the index. So what happens if the market goes down? Let’s say that the S&P 500 does -1.2% for the year. Well, you’re not in the market so you don’t lose anything and you don’t gain anything. Why? Again, your money is not in the market, it remains in the general account of the insurance company. With fixed indexed annuities there are different ways for an insurance company to credit your principal. These crediting strategies can be called cap rates, participation rates, point to point, 2 year points, and spreads. For the scope of this article we will only focus on cap rates, which was described in the example above. We will have another article on this in the future. There is one final thought about fixed indexed annuities and crediting strategies that is really important. If you buy a 5 year fixed indexed annuity with a cap of 7% based on the S&P 500, after year one of the contract, the insurance company takes a snap shot of the index. On that snap shot date, your account is credited the interest of the S&P 500 performance. So if the S&P 500 did 7% your account is granted 7% or $7k. Your account value is now $107,000. That 107k is locked in. It can never go down from there. Now in year 2 of the contract, the S&P does 3%, your account is credited 3% to the $107k. Your account value is now $110,210. Once again the amount is locked in. You’re account never goes down from there. The process continues until the contract expires. Fixed indexed annuities are a great way to invest money by taking part in the market without actually being in the market. In the above example, you can always buy a fixed annuity along with a fixed indexed annuity, creating a balance. The fixed annuity portion can help secure at least 3% return when an index is only returning 1%. Again this is based on the above example and fictional. As always, do your research, ask questions, and feel free to reach out to us at CFE Finaces.com. Thanks for reading. Happy Investing! To all of our CFE Finances customers and to all investors. This month of October has been a tough month to be invested in the stock market. We at CFE Finances want to help all investors through this stock market downturn. This month of October has put fear into investors. The fear has caused the market sell-off. Why wouldn’t investors have fear after seeing their profits in stocks, mutual funds and ETF’s (exchange traded funds) go down 13 days out of the last 15 days. How do you deal with your portfolio dropping without selling your solid investments. Stocks have dropped even after companies have reported higher quarterly sales and earnings that were above analysts estimates. To be fair some stocks have dropped due to a lower future outlook. Why is this happening? It’s due to fear caused by all the bad news of higher interest rates and the China tariffs effecting companies cost of goods. We understand if investors have sold their investments, due to the amount of selling in the markets and have made a good profit. We think if you need the money in the near future its okay to sell. If you can wait until the markets goes higher with high quality stocks you own stay the course of being fully invested in the market. Future retirement investments will still be investing into stocks. There is going to be plenty of cash entering back into stocks once stock prices reach their oversold stock prices. A couple of other options you have is put some of your stocks or mutual investments and ETF’s into a cash account although if your money is in an after tax brokerage account prepare to pay capital gains taxes on your profits. If you are close to retirement you could invest some of your money into an annuity. Be sure to read our newsletter on the Fixed Annuity. Nobody knows the reason why stocks are oversold but many economics and TV stations like CNBC and Fox news are blaming the federal reserve for raising interest rates and the Federal Reserve Chairman has stated he is hawkish about raising rates in December as well as three times in 2019. There is always risks in stock investing. Although there are high rewards when investing in stocks over the long-term. US banks are selling-off due to higher rates that will affect their future earnings. Today October 24, 2018 US housing prices were reported down 5.5%. Higher rates are designed to do this to slow down inflation. Also US relationship with China has cause fear due to the increased tariffs and investors wonder how long the trade war will last before US and China make a deal. It is important to note the China stock market has dropped more than 20%. Other countries like Japan and Europe markets are down. Volatility has increased in all world markets in October. So we need to have a strong stomach for this sell-off and be patience for the upturn. History has shown sell-offs over the last 30 years have created market upturns. We have to realize as investors we need to take the good with the bad within stock markets especially if you have a long time before you retire. We at CFE Finances think once October is over the markets will begin to go up and investors will go back to buying and selling stocks with fundamentals and technical analysis in stocks with strong sales and earnings rather than selling on fear. For example the stock market should go up when stocks report great sales and earnings. Another reason the month of October is known as a market sell-off is because it is the month when stock funds managers are taking profits to show their customers their yearly performance. This may seem odd but there are some good things that can help an investor portfolio after a sell-off. For example when invested in a work retirement account you are buying at lower prices of mutual funds and ETF’s on the day you are paid. Investing at lower prices make you more money in the future when the market goes up. Second you enjoy the dividends of stocks and mutual funds which are reinvesting dividends at lower prices that will buy you more shares. Remember investments wealth grows through compounded money overtime. Buying at lower prices over time builds wealth. Stocks on your wish list can now be bought at lower prices. Also the stock markets new lows are setting up for a longer bull run. Stay invested for the long hall investing in great US companies. Happier days are on the way. Keeping doing your research on your existing and future trades. Most importantly, remember invest in great companies because their stock prices will increase as their business grows their sales and earnings. If you have any questions please email us on our contact page. Happy Investing! The Fixed Annuity- Is it Really just a Glorified Certificate of Deposit (CD)? In the world of investing, there are many types of investment solutions. Have you ever watched a PGA golf tournament on Sunday afternoon and noticed how many commercials there are for financial institutions…Fidelity, Schwab, even Pacific Life, which ends its commercial with their logo…a whale jumping out of the water. Each company advertises a financial concept ranging from overall financial planning to stock trading, or even the misunderstood annuity. With so many investment solutions it can be difficult to match a solution with a need. It’s always prudent for one to do their research before choosing an investment. Easier said than done. So to help navigate, let’s just focus on one financial solution, which is the fixed annuity. The fixed annuity as you will see is really just a glorified CD. So what is a CD? When a person enters a bank and asks for CD rates, they are asking for safety and a guaranteed rate of return. The bank who issues the CD guarantees both to the customer. The banks says, give us a dollar amount for a certain number of years and we will give you your money back at the end of those years along with interest each year. So you can buy a 3 year CD that pays 1.25% a year, maybe even as high as 2.2% depending on the bank. If you need money from the CD, the bank can penalize you, so if you buy a CD make sure you don’t need the money within that time period. So then what is a fixed annuity and why is it a glorified CD? The fixed annuity functions exactly the same way as a CD. Provide a lump sum of money to an insurance company, not a bank, and you are guaranteed a rate of return. A fixed annuity can tie your money up for 3, 5, 7, and the not so common 10 years. The longer the time frame the higher rate of return. Some fixed annuities at this time of publication provide anywhere from 2.75%-3.90% depending the on insurance company and the initial premium. However, there are differences between a CD and an annuity, and those differences can lead to some advantages. The main difference between fixed annuities and CD’, are that annuities are not FDIC insured. They are insured through the insurance company. The other main difference is annuities allow for tax deferred growth, unlike CD’s, which interest is taxed each year. Tax deferred growth means that the interest you earn is not taxed until you withdraw the money. By deferring taxes your money can grown more efficiently. So why buy a fixed annuity? A fixed annuity is for someone who is looking to get a better rate of return than banks can offer, but also have the benefit of tax deferred growth. Fixed annuities aren’t growth oriented strategies, they are ways of preserving wealth and getting more interest. They should be a small part of your overall investment strategy. Always take the time to understand the annuity contract and look for any hidden fees. With fixed annuities there usually isn’t any fees unless you buy a rider, which will not be discussed in the article. As always, thanks for reading and if you have any questions, feel free to reach out to anyone at CFE Finances.com. This newsletter is intended to help investors understand the price to earnings ratio. A question was posed by a CFE Finances customer; who asked if a P/E ratio of 1 is the best P/E ratio. It is a great question so lets dive in. When the P/E ratio is 1, it indicates the stock is out of favor (possibly undervalued). It also means the company has excellent earnings and has good value. For example if the price of a stock is $10 and company’s earnings per share is $10 the P/E ratio is 1. Like we indicated, a $10 earnings per share is very good. But a price of $10 is low for a stock that has such great earnings. On the other hand when a stock has such a low P/E ratio it can mean investors are not buying the stock. But I have to mention the example we just gave doesn’t happen. The reason it doesn’t happen is a company with $10 in earnings per share, their stock price would be much higher because they are making so much money. We calculate earnings per share (E.P.S.) by dividing the net earnings into the number of shares a company has to sell called outstanding shares. The way the ratio works is you need the stock price to appreciate along with the company earnings to give you a P/E ratio that is comparable to other stocks within its sector or industry. Investors need to like the stock and buy it for this to happen. Also think of the P/E ratio as a fundamental ratio, as a P/E ratio increases it shows us as an investor the stock is price is appreciating due to having strong sales and earnings. Another way to think of the P/E ratio is when it is high the stock is in favor due to the emotional effect buyers have for the stock. When a company doesn’t have a P/E ratio it due to having no earnings. In other words buyers like or sometimes love a stock so much they do not pay attention to the P/E ratio. Some investors buy a stock due to their strong sales of company products or services and believe the company will be profitable in the future. You may ask how does a company operate their business with no earnings. Companies use their stock equity to grow their business as well as supplying cash flow to run their business. Another tip for another time, this is called market capitalization. Not to confuse you but you can also view the P/E ratio as what you as the investor pays for each dollar a company earns. For example if a P/E ratio is 10 you can think you are paying $10 dollars for each dollar the company earns. So if the P/E is too high, we say a stock is expensive. Remember before buying or selling a stock we need to compare companies in its sector or industry. For example when researching Home Depot stock we want to compare it to Lowes stock. We need to determine both Home Depot (HD) and Lowes (LOW) 5-year average P/E and present P/E. A stock P/E ratio can be calculated or can be found on a Value line survey. We want to buy a stock when its P/E ratio is below the 5-year average and sell it when P/E ratio becomes too high. A good rule of thumb is sell a stock when the P/E ratio is 1.25 times the P/E ratio when the stock was purchased. Good luck and happy investing from CFE finances! We will be in touch with another newsletter soon. If you have any questions or concerns email us from our contact page.